Radio Spectrum in New Zealand is allocated for a number of uses, including broadcast, narrow-band radio communications, point to point linking, and cellular, to name a few. Cellular spectrum in New Zealand is auctioned on the basis of blocks of a particular frequency range that is exclusive for the use of an operator across the entire country. These blocks are awarded on twenty year terms that appreciate the huge capital expenditure and time commitments involved in building national cellular networks. 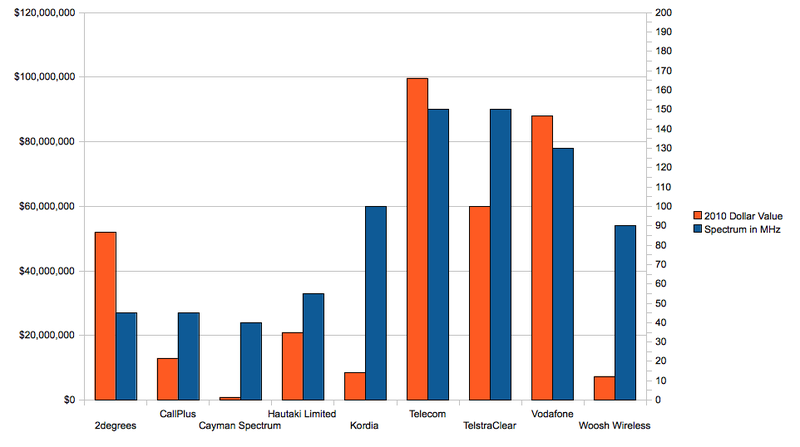 Some carriers have dedicated an immense amount of resources to the acquisition of prime spectrum in New Zealand, while others have taken a value for money approach to acquisition. The following chart shows the amount of national spectrum licensed in megahertz (MHz), and the approximate aggregate dollar value of that spectrum (in Q3 2010 dollars), on a per-carrier basis.